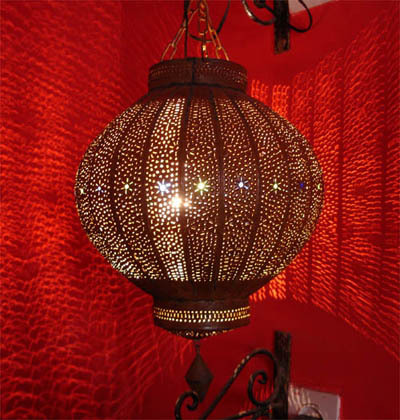 Made of rustic sheet metal, this hanging lamp made in the souk of Marrakesh by master artisan. All handmade and hand hammered. This unique hanging lamp will give a special tone and ambiance to any room. Only when lit in a darkened room can their beauty be truly appreciated. Light filters through intricate cutwork patterns and coloured glass, and creates a beautiful "starry" canopy.